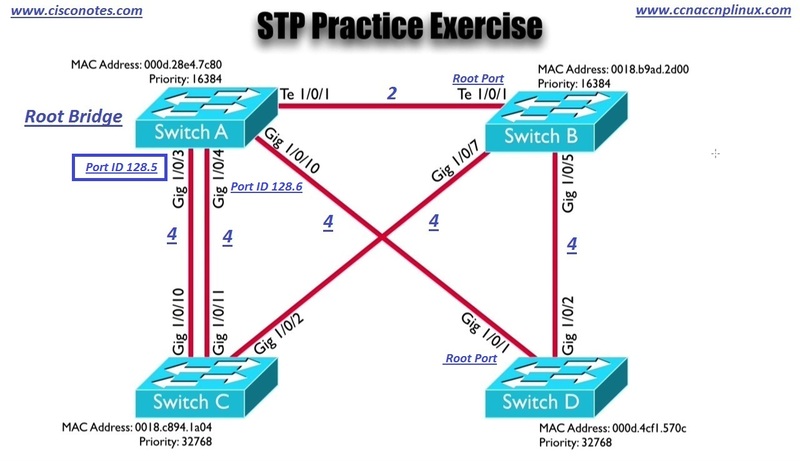 Let’s see, what we learned about Spanning Tree Protocol so far, and do a paper exercise. Let’s take a look at this topology and Determined Theoretically. Ø Who would be the Root Bridge? Ø What would be the Root Port’s? 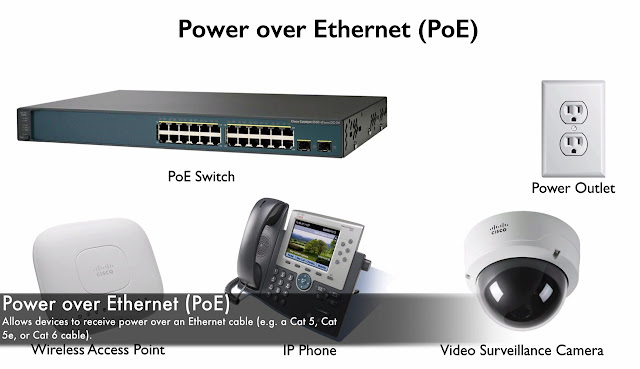 Ø Which Ports would be the Designated Ports? Ø Which Ports would be Blocking? Remember that the Mac-Address is the Tie-Breaker, if the Priority is equal. Let’s take a look at Priorities “do they equal”. I am noticing that, the Priorities for Switches A and B, they are lower, they 16384. Those are lower than the Priorities on Switches C and D, that means that either, Switches A or Switch B is going to be our Root Bridge, but which one. Here what the Mac-Addresses come as a Tie-Breaker, which switch as the “Lowest Mac-Address”, if we take a look at first 3 Hexadecimal digits in the Mac-Addresses of these Switches. Switch A has the first 3 Hex Digits as “000”. On Switch B, its “001”. “000” that’s lower than “001”, that tells us that, Switch A is going to be our Root Bridge. Ø What are the Root Ports? Remember the definition of the Root Port. We said that “the Root Port is a port on a Non-Root Bridge, the Root Bridge, Switch A is not going to have any of these, but it’s the port on a Non-Root Bridge, that is closest to Root Bridge in terms of Cost”, and we going to assume that, all over those interfaces are running out their maximum speed, another words this “Te interface” that’s a “10 Gigabit interface”, we assuming, it running out “10 Gigabit” and if does that means, it’s gonna have “Cost of 2”, and a “Gigabit interface”, which is what all over the other interfaces are, there gonna have a Cost of 4. What is the Root Port on Switch B? What would be the Cost to get back to Switch A. Well if I went out of the 10 Gigabit Port, it would be a Cost of 2 to cross the link to get to Switch A. I got other ways of getting the Switch A though. I could go down to “Switch C with Cost of 4” and then go, from Switch C, up to Switch A, with another Cost of 4, that the Total of “8”, 8 is much more than 2. Ø Same thing, if I went from Switch B to D, Switch D to Switch A, that would be a Cost of 4+4=8, much greater than 2. 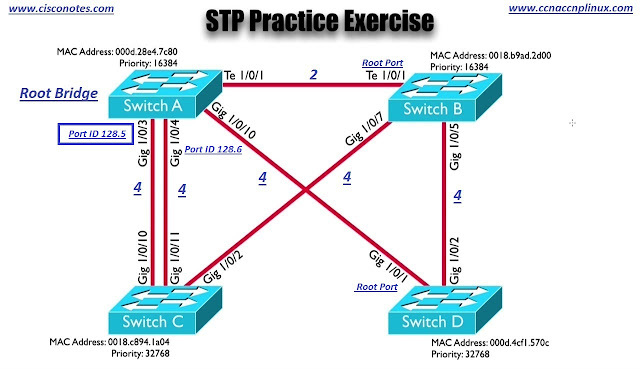 This tells me that my “Root Port” on Switch B is my “Te 1/0/1(10 Gigabit)”. 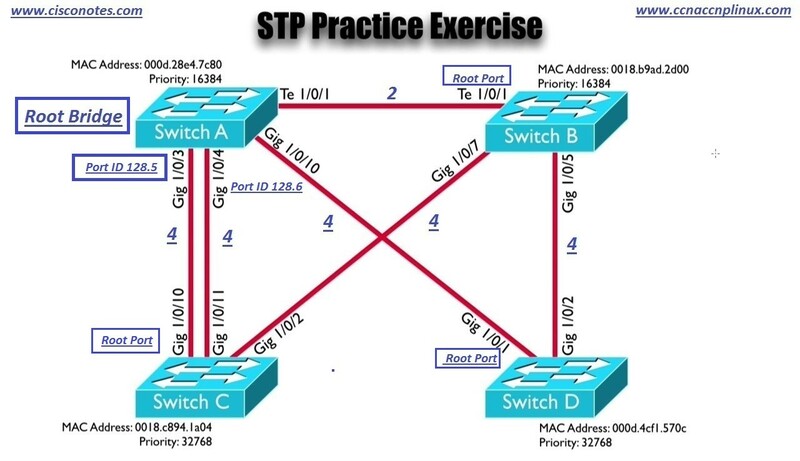 What about Switch D, Well Switch D could go directly to the “Root Bridge over a Gigabit1/0/1 Port”, that would be a “Cost of 4” or It could go over to Switch B, which would be a “Cost of 4”, than over to Switch A that an additional “Cost of 2”, 4+2=6, 6 is greater than 4, that tells me that, Gigabit 1/0/1, that is my Root Port on Switch D.
Next Switch C, on Switch C if, I went from to Switch C to B to A, that’s the “Total Cost of 6”, but Notice Switch C has a couple of Ports, that would get me up to Switch A. Now let’s start to get a bit tricky. Ø Which one of these is going to be Root Port, which one is considered closet to the Root in terms of Cost. It looks like, we have an equal Cost, either path is a Cost of 4, what do, we do now. Well this is a common point of confusion for student learning Spanning Tree Protocol. We going to go with the “Lowest Port ID”, but it’s not the “Lowest Port ID on Switch C”. It’s the Lowest Port ID, that is sending traffic into Switch C. It’s the “Sender’s Port ID”, that’s we gonna be comparing. In this case “Gigabit 1/0/3 and Gigabit 1/0/4”. With default settings “Gigabit 1/0/3” is going to have the “Lowest Port ID”, because the “Port Number is Lower”. You see the way the Port ID works is, there is a Port Priority, that defaults to 128 and then there is a Dot (. ), after the Dot (. 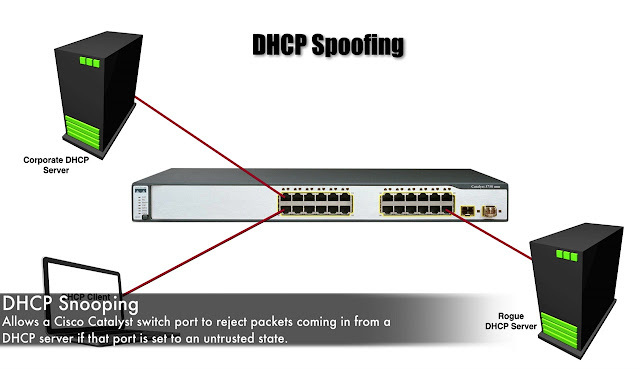 ), there is a Port Identifier, and typically on many Cisco Catalyst Switches. This Port Identifier is going to be a number, that’s too greater than this number. Ø And the Port ID of Gigabit 1/0/4 would be “128.6” and Switch C can see that information. What if we wanted to manipulate that, though in the Real world? What if I prefer that the link connecting into Gigabit 1/0/4 be used? Well we not able to change this (.6) component of the Port ID, that’s the Physical Location within the Switch. That’s Not Configurable. 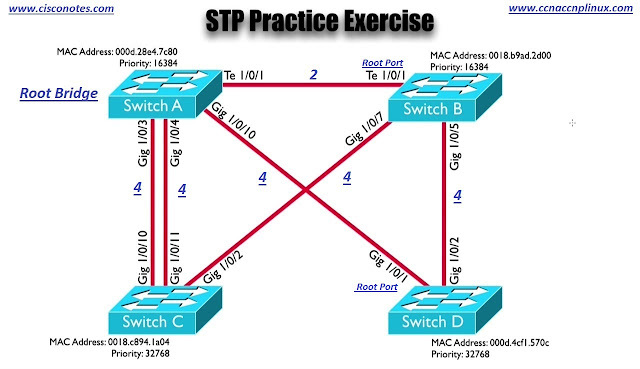 However, we can change the Port Priority (128), in this example, I could go to “Gigabit 1/0/4” and I could change the Port Priority from 128 to 64, making the Port ID 64.6 that would make it Lower than 128.5, that would make this Gigabit 1/0/4 Port, the link that was forwarding traffic. But not in this case. IN this case, we have a Default Settings and since, Sender’s Port ID is less for 1/0/3 this link, that means that “Gigabit 1/0/10 is going to be my Root Port”, “that’s gonna be closet to the Root Bridge in terms of Cost”. The actual Cost was equal, so the Tie-Breaker became the link, which connected to the Lowest Port ID. The Port ID on far end Switch, Switch A in our case. We now identified the Root Ports. Next up we have Designated Ports? 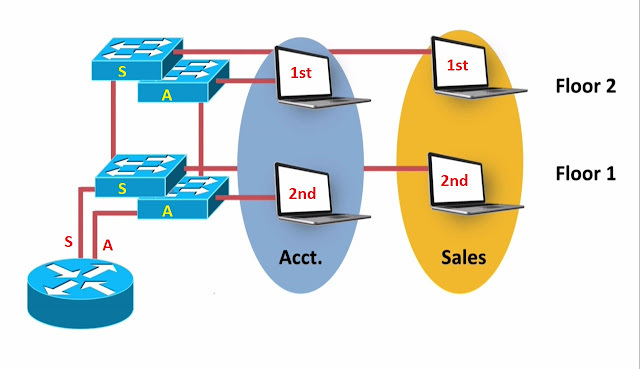 Remember the definition of a Designated Port, we said that every link, every network segment has a Designated Port, and “it’s the Port on that segment that’s closet to Root in terms of Cost”. And we said that we not going to get any closer to the Root, then actually being on the Root, which means that, all of the Ports on the Root Bridge are Designated Ports, and that count for 4 our links. Well if I am looking from the prospective of, this Gigabit 1/0/5 end. If I am on Switch B, I got the Cost of 2, to get back to the Root, if I am on this Gigabit 1/0/2 end of the link, that would have a Cost of 4 to get back. So, this Gigabit 1/0/5 has the Lowest Cost. This means that, this Gigabit 1/0/5 is going to be my Designated Port on Switch B.
Ø Who is the Designated Port Here? Well by the same logic, if I am this Gigabit1/0/7 end of link, we gonna have the Cost of 2 going over that Te 1/0/x link, to get back to the Root Bridge, if we are in this Gigabit 1/0/2 (Switch C) end of link then I would have a Cost of 4, that means that this Gig1/0/7 going to be My Designated Port on Switch B. And we assuming that all of the interfaces are administratively up. We don’t have any to these interfaces that are administratively shut down, and if that’s the Case, any port that we don’t yet Labeled, is going to be a Blocking Port or rest of the Ports are Blocking Port. 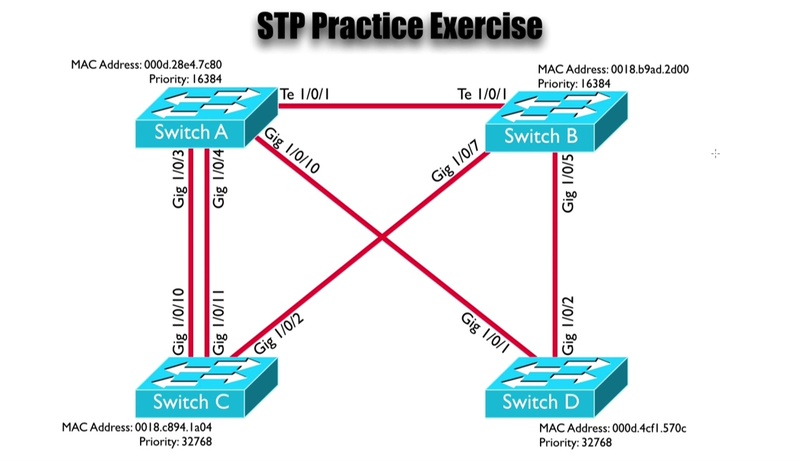 Ø This Gigabit 1/0/11 on Switch C is going to be a Blocking Port. 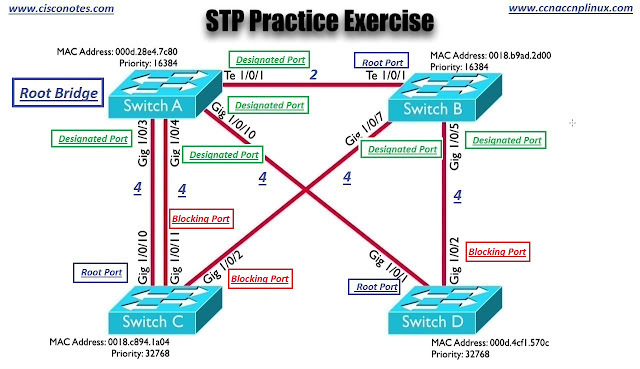 Ø And this Gigabit 1/0/2 on Switch C is going to be a Blocking Port. Who is the Root Bridge: - Bridge with a lowest Bridge ID, we look for the Switches with Lowest Priorities and if we have Tie, Mac-Addresses of those switches become the Tie-Breaker. 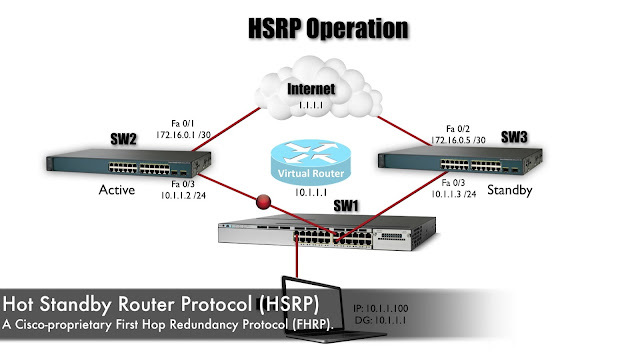 Ø if we had a “10Mpbs Port that would be a Port Cost of 100”. Ø “A 100 Mbps Port that would be a Cost of 19”. OMG! No comments, this exercise cleared aaaaaaaaaaaaall my doubts. Awesome Post!! !You have clearly explained this info.Its very useful for me to know about new things. Keep on blogging. It's very great post... Really you done a wonderful job ... Keep up the good work and continue sharing like this.